The original purpose of the First Edition of Physiology of the Gastrointestinal Tractto collect in one set of volumes the most current and comprehensive knowledge in our fieldwas also the driving force for the Fourth Edition. The explosion of information at the cellular level, made possible in part by the continued emergence of powerful molecular and cellular techniques, has resulted in a greater degree of revision than that of any other edition. The first section, now titled "Basic Cell Physiology and Growth of the Gl Tract" contains numerous new chapters on topics such as transcriptional regulation, signaling networks in development, apoptosis, and mechanisms in malignancies. Most of the chapters in this section were edited by Juanita L. Merchant. 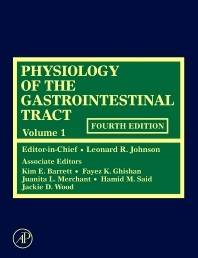 Section II has been renamed "Neural Gastroenterology and Motility" and has been expanded from seven chapters with rather classic titles to more than twenty chapters encompassing not only the movement of the various parts of the digestive tract but also cell physiology, neural regulation, stress, and the regulation of food intake. Almost all of the chapters were recruited and edited by Jackie D. Wood. The third section is entirely new and contains chapters on "Immunology and Inflammation" which were edited by Kim E. Barrett. The fourth section on the "Physiology of Secretion" consists of chapters with familiar titles, but with completely updated information to reflect the advances in our understanding of the cellular processes involved in secretion. The last section on "Digestion and Absorption" contains new chapters on the intestinal barrier, protein sorting and ion channels along with those focusing on the uptake of specific nutrients. These chapters were recruited and edited by Hamid M. Said and Fayez K. Ghishan. Mechanisms of Helicobacter pylori-induced Gastric Inflammation Dawn A. Israel and Richard M. Peek Jr. Professor of Medicine and Vice-Chair for Research, Department of Medicine, University of California, San Diego, San Diego, California, U.S.A.
Horace W. Steele Endowed Chair in Pediatric Research Head, Department of Pediatrics and Director, Steele Children's Research Center, Department of Pediatrics, University of Arizona Health Sciences Center, Tucson, Arizona, U.S.A. Professor of Internal Medicine and Integrative and Molecular Physiology, University of Michigan, Ann Arbor, Michigan, U.S.A.
Dr. Said is a Professor of Medicine, Physiology and Biophysics at the University of California School of Medicine Irvine, CA. He is also a Senior Research Career Scientist at the VA Medical Center, Long Beach, CA; and Chairman for the Southern California Institute for Research and Education (VALBHS affiliated non-profit). He serves as a reviewer on a variety of NIH, VA and other national study sections as well as international (European) study sections dealing with medical research in internal medicine and nutrition. He is also a member of Editorial Boards of a number of prestigious medical research journals. Research in Dr. Said laboratory focuses on understanding cellular and molecular mechanisms involved in the transport of water-soluble vitamins (folate (vit. B), thiamine (vit. B1), riboflavin (vit. B2), pyridoxine (vit. B6), ascorbic acid (vit. C), biotin (vit. H) and niacin (vit. B3)) in the intestine, kidney, liver and pancreas. Dr. Said's laboratory has published over 160 original research papers in the gastrointestinal and nutrition fields. He has authored many chapters in scientific textbooks as well as a book in these areas. His laboratory has contributed many original discoveries to the field over the years. His research activities are funded by the VA and National Institutes of Health over the past twenty four years. Professor of Physiology and Cell Biology and Internal Medicine, College of Medicine, The Ohio State University, Columbus, Ohio, U.S.A.